The Triumph Motorcycle India line-up has two unusual, bug-eyed Roadsters which one cannot ignore. The bigger Triumph Speed Triple can be distinguished by its bikini fairing and dual under-seat exhausts that also sports a meatier 1,050cc motor, churning out 135PS maximum power at 9,400rpm. But the smaller Triumph Street Triple holds greater importance to Triumph Motorcycle in India. This one is light and compact and perhaps one of the most sought-after models in the British bike maker’s entire line-up, bearing a tempting price tag of Rs 8.5 lakh (on-road Pune). Second only to the iconic Bonneville. You don’t have to look twice to know that it’s a Triumph Street Triple. With minimalistic design, pure muscle, no unnecessary plastic panels and a pair of conservative tank scoops, it does stand out. The engine is bare and is a vital part of the overall design. The twin headlights resemble eyes which have just popped out, as if the Triple had just spotted Steve McQueen ride by on his Bonnie! But the novel headlight design is unique to only Triumphs. You either love it or hate it. Everything on the Triumph Street Triple resonates top-notch quality and exceptional finish - right from the soft-touch palm grips, easy to reach control switches or the neatly laid out instrument console. The twin trip computer throws information like fuel economy, range and lap timer. There’s even a smart gear-change LED indicator on the console which can be programmed to one’s riding style. Then there are smaller features like the adjustable brake- and clutch-levers; under-seat storage which can hold a D-lock; and the solidly built mirrors which give excellent rear view; which make the Triumph Street Triple special. Off-the-shelf colours include the sombre Phantom Black, seen on our test bike, or more eye-catchy hues like Caribbean Blue, Cosmic Green and the popular Crystal White. The Triumph Street Triple isn’t a tall bike and is perfect for average built Indians like me. Yet the 800mm saddle height, conservatively stepped seat and deep tank recess can comfortably accommodate even taller riders. The compact size and 183kg weight also make the Street Triple pretty manageable for everyday use. Moreover, it has excellent geometry between the seat, handlebar and footpegs, offering a very relaxed riding position, which is ideal for our country. The Triumph Street Triple, as the name suggest, comes with a unique three cylinder 675cc, four-stroke, fuel-injected and liquid-cooled motor. Unique, because Triumph is the only company which offers a three-pod engine in a distinct in-line configuration, in India. It is very different from the more common in-line four, as the three-pod gives the Triple a maverick nature and it feels like nothing I’ve ridden before. The in-line three is neither as refined nor does it sound as silky as the fours, but it is rich in character. It’s difficult to not get hooked to its unorthodox nature. The engine and exhaust note are like no other, and can be easily distinguished from the run-of-the-mill. Our test bike came with the after-market Arrow exhaust, which made the Triumph Street Triple crackle and sputter, as if it was foaming at the mouth in excitement, encouraging to be revved harder. The power band is simply fantastic. Generous portions of the 68Nm torque flows in right from as low as 3,000rpm. No matter where the tacho needle is, probe it and the Triumph Street Triple pulls hard, instantly and in seconds crosses the double tonne mark. Crack open the throttle and Triumph can be revved right up 12,500rpm mark. The brilliance of the engine is that the power isn’t frantic, but on the contrary, flows nice and smooth. Although there’s always enough power on tap but it never feels rabidly snappy. And, with a maximum of 106PS at 11,850rpm this light weight roadster would be a handful on the track as well. The only major drawback, on track and during long distance touring, on this naked street would be the strong windblast the rider has to face. The Triumph’s light and progressive clutch action and the butter smooth six-speed gearbox are equally impressive. Especially for a bike of this size. The well spaced gears ensure that the engine remains relaxed most of the time. With heap loads of torque at my beck and call, the Triumph Street Triple can cruise on three digit speed without remotely straining the engine. It is a sharp handling bike with well distributed weight. To make the mass more centralised, the Hinckley engineers have positioned the coolant container under the bike, near the exhaust cat. Obviously it’s an odd location for a plastic container and the chances of it getting damaged are quite high in our country. But the good news is that the Triumph Street Triple’s low centre of gravity; sporty-firm setup of the upside down front forks and rear mono shock; and the newly designed aluminium twin spar frame makes it extremely agile and nimble. Flick it around chicane or manoeuvre through the city. It obeys every command that’s conveyed through the handlebar. Our test bike was running on a pair of Pirellis (120/70 ZR 17 and 180/55 ZR 17 in front and back respectively) and there’s no dearth of grip either. While it’s small turning radius is an advantage for every day manoeuvring through traffic too. The large 310mm front discs offer balanced and controlled stopping power, while a 220mm disc looks after the rear. They offer strong bite and have good feel. 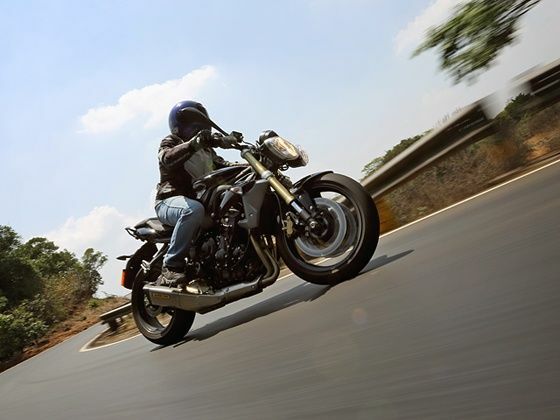 Thankfully, ABS comes as standard on the Triumph Street Triple and works like a charm. The system is a must on our country. It saved me a couple of times and once even a jaywalking chicken. There’s a lot the Triumph Street Triple has to offer for Rs 8.5 lakh (OTR, Pune), and at the price has very little competition. If you don’t judge a book by its cover and can get over the bug-eye face, this maverick Triple has in store what very few bikes in the segment can to offer.